A broker who desires traders to win is finally here- IQ Option. 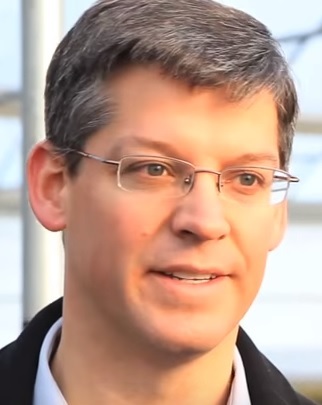 A Cyprus Investment Firm known as Investlab Holdings Ltd regulates and owns the company. Hence, worrying about your money should be out of the topic since the company has to adhere to all the trading rules. IQ Option trading platform is unique since it was developed from the scratch. The platform is easy for both veteran and novice traders. The team is always working hard to ensure the platform is better each day and their services are top of the industry. Unlike most brokers out there, IQ Option does not bring pushy sales. A free demo account upon registration is available to allow you to test the platform and its features. Their real time trading is always available 24/7, offering traders an opportunity to gain up to 90% per trade. They have several assets, including Stocks, Indices, Forex, and Commodities on their Turbo (60 sec) and Binary options. Hence, you get diverse opportunities to earn a handsome payout. Their secure and regulated deposit and withdrawal methods ensure traders concentrate only on making profits. IQ Option is a broker who values every trader regardless of experience, knowledge or level of income. They always have a place for everyone to make a profit. After registration, you can use the demo account to test the broker and its offers/ features. After that, you can upgrade to either a Real or VIP account. Although both Real and VIP account levels come with features that allow traders to make profitable trades, VIP account promises greater opportunities since it has a plethora of features and details to enhance a rich trading experience. However, our team was disappointed by the fact that the broker has only two levels of real trading accounts. Most of the binary options brokers we have reviewed have three or more levels to bring diversity in trading experience. 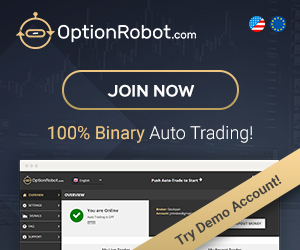 After signing up with IQ Option, you will have complete access to a demo account without paying anything. The account comes with 13 assets from which you can choose your trading assets to make trades. Placing trades involves using demo money. Since the account is free of charge, you do not have to worry about losing your money in erroneous moves. To top it all, IQ Option provides clients with an opportunity to use the account as long as they want. Hence, you may take as much time as you want to learn the platform before switching to the real world of trading with the broker. For traders who are beginners in the industry or want to start slowly with the broker, IQ Real account is a suitable choice. You need to deposit only a minimum of $ 10. The amount astonished our review team since it is the lowest in the industry. As if that is not enough, you receive bonuses of up to 27% on each deposit amount you make. The account level comes with more than 77 trading assets, giving traders an opportunity to select from diverse trading opportunities. Unlike the demo account, this level gives you with full access to trading opportunities. Traders at this level can also participate in trading competitions to make extra money. If you want to withdraw funds, you just have to wait for less than three days to receive your money after placing your order. VIP account also avails a personal manager to every trader at this level. Since managing funds and trades is easier said than done, we found this to be very encouraging. IQ Option also provides traders at this level with a monthly analysis of their trading. Their trading experts and analysts will help you analyze your trades and profits to ascertain your success and advice accordingly. We highly recommend you begin straight from the VIP level. The account can pay back the amount invested within a few weeks and begin bringing profits. The assistance of free monthly analysis and personal manager can be of great help especially if it is your first time to dip your toes in the world of trading binary options. The account will allow you to keep losses to a minimum since it offers better refunds in case you make wrong predictions. Unlike most brokers out there, IQ Option uses its trading platform. Brokers such as Porter Finance, Banc De Binary, and GOptions use SpotOption platform as their trading platform. The trading platform of IQ is user-friendly and has super responsive live graph feature that brings fun to the trading experience. Unlike on some brokers’ website, it is impossible to make inadvertently placing a wrong trade when you use IQ Option trading platform. We give the platform a thumb up for having many unique features whose designs enhance an effortless trading experience. If you think you will take more than fifteen minutes before you master the platform, you are wrong. Our team spent just less than fifteen minutes to learn the platform and place a trade approximately. 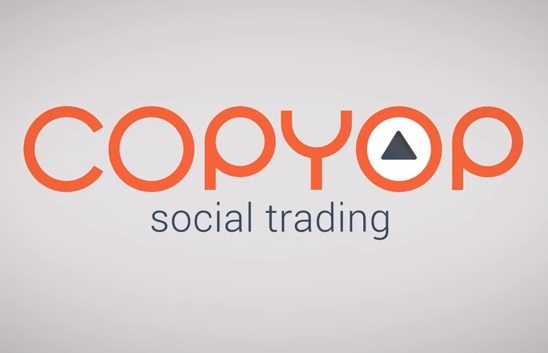 If you have just begun trading on the platform, you do not have to worry since they stock comprehensive video tutorials that will walk you through the simple steps of placing a trade on the platform. When we first used the platform, we simply located a tab on top of the price chart and selected the asset with which we wanted to trade. A drop-down menu on the right side of the tabs availed to us more assets. On the right side at the furthest end, users will find the action buttons for the CALL/PUT options that they want to execute. Here, you can also decide the trade amount. Most trading platforms use a slider bar to assist users in selecting the trade amount. However, at IQ Option, they have already predefined the investment amounts. You can decide to choose from fixed amounts such as $ 10, $20, $50 and $ 80. Alternatively, you can decide to key in the amount box the amount of funds you want to invest. The platform’s left-hand side offers traders with a plethora of the navigation choices. Here, you can access the types of trade that you want to execute as well as your personal cabinet section. You can access information such as trading history and banking transactions in your personal section. Do you want to reach out to the support team? Their support option is also in the personal section. The platform offers real-time charts to help you follow changes in the price of the desired asset. The feature is very useful since it is not advisable to make a blind move and expect to earn great profits. If you are looking for a tool that will help you analyze your trades, be sure to get it from the technical analysis panel. The platform allows traders to either use a tick chart or candle chart. Unlike most broker websites, which use candlestick chart, you can also use tick chart to enhance your trading experience. The trading platform also has traders’ choice indicator, which allows a user to have a direct view of whether the call or put is more popular than the other alternative. We all look up to those who are experts for us to get some insightful ideas in whatever we want to do. We found out that IQ Option understands this. Hence, they have a place where you can view top investors’ statistics and best deals. If you decide to follow their example, you can get quick insights on how to go about in the profit-making trading of binary options. Based on the technical analysis, you can also make informed future price movements. If you are green when it comes to interpreting the charts for yourself, predictions from professional investors can come in handy. These technical analyses cover the performance of assets, their prices and changes in the trend. They also have relevant financial news. We cannot always depend on our intuitions and experience for successful trading experiences. We need to familiarize ourselves with economic news from around the world to make informed choices. With IQ Option, the good news is that there is no need to search all the major economic news outlets by you. The broker has done the legwork for you. Simply go to their website and avail the news before making a trade. As we have seen, the platform will optimize every space of your screen to ensure you do not miss anything when trading. Forget those flashy and pushy sales messages that are characteristics of most websites out there. A smart-phone app that allows users to trade on the go is also available with the IQ Options. You do not have to stick on your chair behind your computer all day long. As such, trading success goes on even if you are traveling. 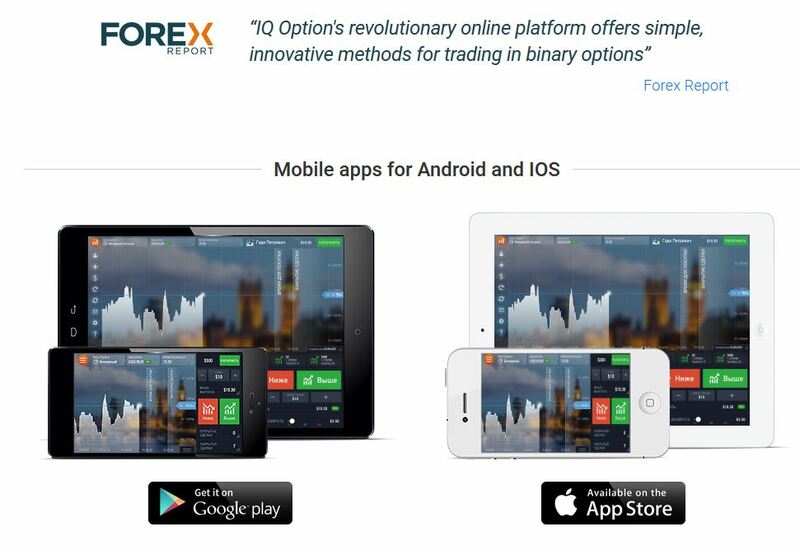 If your operating system is Android or iOS, you can have the app to make your trading experience just a few clicks away wherever you are. With a smart-phone app, you can access your account and proceed to place new trades. You can also deposit, withdraw and do other things with your account. Accessing IQ Option Trading Platform on your smart-phone does not limit the benefits that the broker provides. You just enjoy the same benefits as a person using a laptop or tablet. Every trade requires a minimum investment of $1 to execute. In our view, this is the lowest amount in the industry. Hence, you do not have any financial excuse as to why you cannot trade binary options. Their maximum investment requirement is $1000 per trade. The amount is enough for high-rolling traders who are willing to accommodate high risks to increase their yields. For instance, you can increase your stakes as high as you desire by setting some $1000 to investments in a row. IQ Option values security and safety when it comes to handling traders’ transactions and money. They always make sure they have sealed every loophole through which cyber theft and fraudulent transactions tend to mushroom. As one of the licensees of CySec, they have to ensure they have followed every protocol and procedure. Their priority is to put the client first before anything else. Another thing that makes their banking process to be top notch in the industry is the fact that they accept a wide variety of payment methods. If you fancy using credit cards, you can choose from the major credit cards available. For example, you can use Visa or MasterCard. The method provides quick and easy transfer of money between you and the IQ Option account. For users that prefer the traditional money transfer method, IQ Option provides bank wire transfer. It is crucial to consult your bank for the charges associated with this method of payments to avoid inconveniences. Although the method is secure, you will have to wait for more than five days before your funds land to your bank account. You may also choose to use Skrill, WebMoney, QIWI, YandexMoney, Liqpay, Paypal, or Moneta. IQ Option always ensures clients receive the funds they have withdrawn from their account within 1-3 business days. For VIP account holders, withdrawal process takes less than 24 hours. 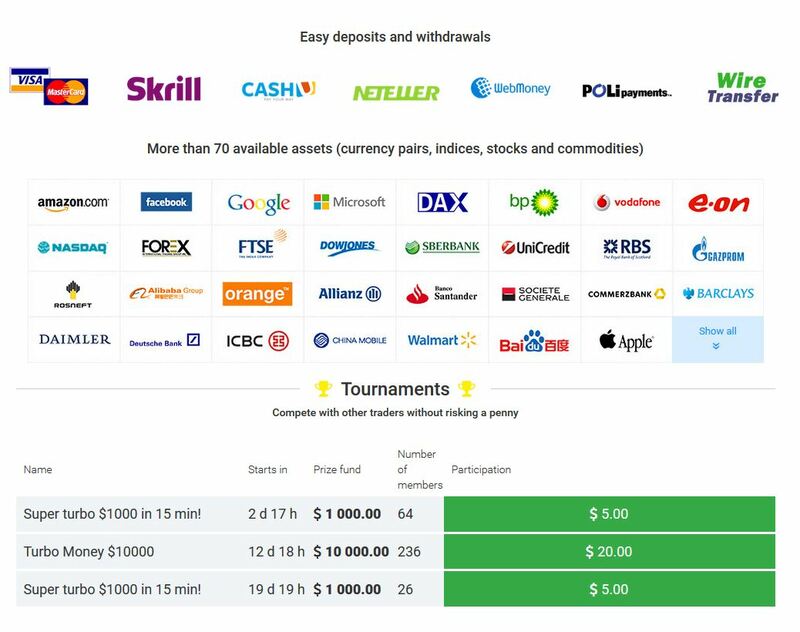 IQ Option charges a withdrawal fee that ranges from $5 to $10 based on the method you have used to withdraw your funds. As much as one can withdraw as low as $10, it is recommendable to withdraw more than $50 or so to reduce withdrawal expense. A website that puts its clients top on the list of priorities is worth joining. The website wants to see to it that every trader finds comfort and security when trading binary options. If the traders experience any problem whatsoever, there need to be diverse means through which he can reach the support team. The support team should consist of highly professional personnel that deal with each query without leaving any stone unturned. In our view, we think IQ Option Customer Support is a dedicated team that ensures clients make profits without having to go through headaches. The team has knowledgeable professionals that can ensure you an answer within no time. We found out that even though the special target of IQ Option is the Russian clients, most people from around the globe could access and enjoy their services. They support many languages, such as English, Spanish, Portuguese, Indonesian, Italiano, German, Korean, French, Norwegian, Swedish, and Turkish. In our view, we think IQ Option is one of those websites that has embraced a high level of multilingualism. Most competitor websites support only a few languages, hence limiting a huge number of clients who want to be traders in binary options. They have an FAQ section that provides answers to the most common questions that exist among traders that come on their website. The answers are straight to the point without beating around the bush. However, in our view, we believe the answers to the frequently asked questions are few. Some clients may fail to get answers to their questions. Hence, we recommend that you keep in touch with the support team in case of any issue. If you encounter any issue or need clarification, simply hit the “Contacts” button. The website will take you to a web form where you will have to fill some basic information about yourself and the question. After clicking the send button, a customer service member will be back to you with an appropriate answer within no time. You can also inbox them a message via their email contact to seek a more comprehensive answer. Their website also provides company addresses for their services. Hence, you can send them a letter if you find the channel to be more convenient than other means. Of course, you will have to wait for long to receive back a reply. However, our team failed to find and use Live Chat feature on the website. We believe a great broker like IQ Option needs to have such great features to make it possible for communications. A Live Chat offers an instant mean of communication. We all know that time is precious when it comes to trading binary options. Thus, we believe that the website will realize this and add the chat feature. They should also add a Skype contact since it would allow for some personal facial contact. Nonetheless, IQ Option has provided phone contacts through which you can reach their support team without much effort. Be sure to get an answer to your question at a go, even though you will have to pay telephone charges to your provider. Overall, our team concluded that their support services are at the top of the industry since they provided us with appropriate answers to our questions. We all know that knowledge is power. Every mean of earning a living or extra dollars needs you to learn at least some basic skills. As you built on these skills, you can become a professional in the venture. Hence, whether you are a novice or seasoned trader in binary options, be sure to look for a website that provides comprehensive learning materials to get you going. An excellent broker will not leave you to guess your way forward since it will guide you through all the steps. 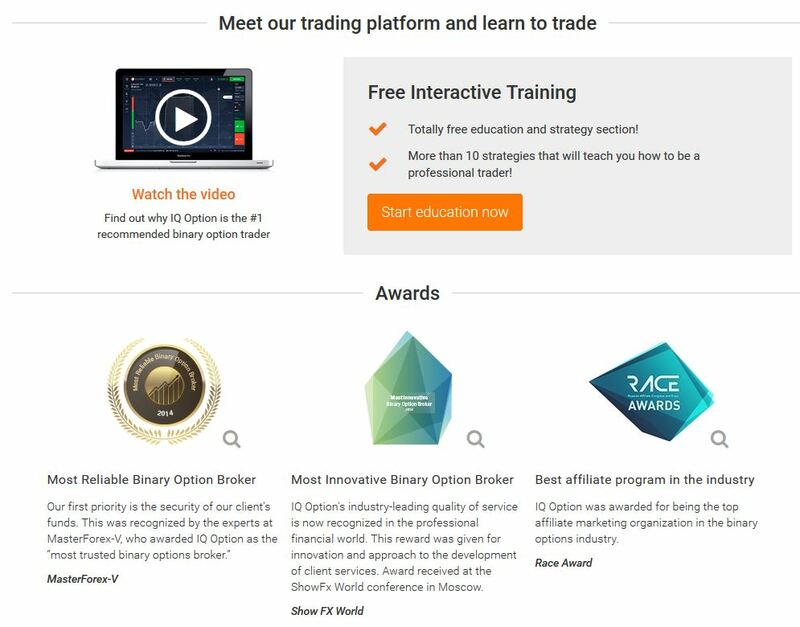 In our view, we give IQ Option a thumb up for its excellent learning materials in its Education section of their website. The section contains a plethora of videos on diverse topics to ensure every client gets a chance of being topnotch in the industry. Their platform review video tutorial will walk you through the basics of using the platform to make trades. The IQ Option does not use a background voice of someone trying to explain the features. Rather, they use eye-catching and appetizing images of the platform and its usage to drive the message home. Within 30 seconds, you get a clear glimpse of registration requirements, minimum deposit, placing a trade and other details. The successive videos give more details about the respective features and usage of the platform. The Registration and Interface video tutorial gives detailed information about the process that you need to go through in registering your account. You will find out that the process is stress-free especially after going through the video. A serious trader should never go to the trading ventures without strategies. You cannot go to war without all the necessary weapons. 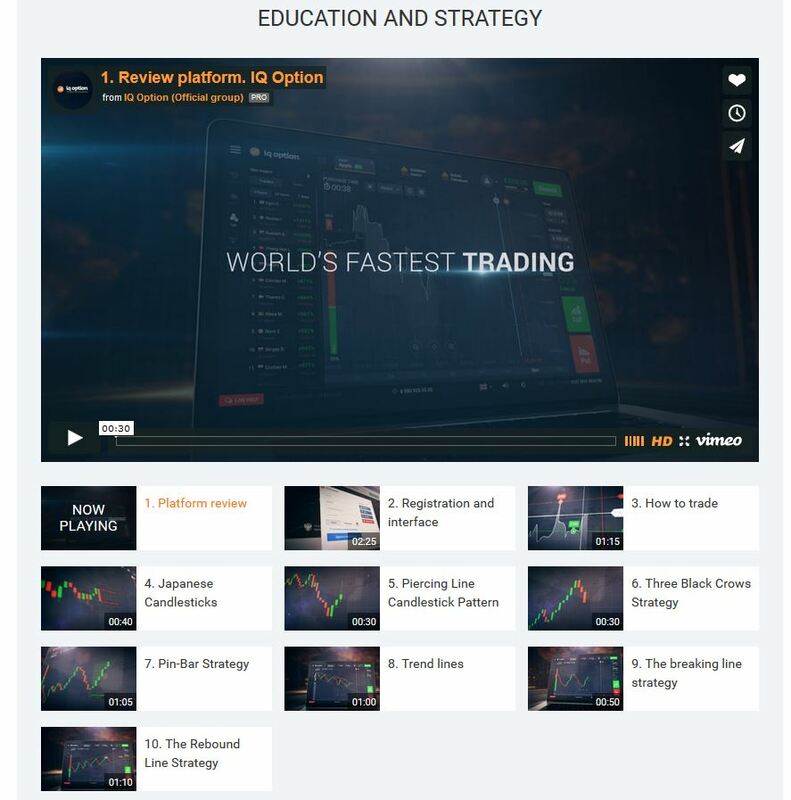 Since IQ Option understands this, they have a rich library of video tutorials that teach clients on several strategies and using them to bring in profits. Be sure to follow the videos to get a good grounding when it comes to using diverse trading strategies such as Japanese Candlesticks, Pi-Bar Strategy, the Rebound Line Strategy, Three Black Crows Strategy, and the breaking line strategy. Apart from the videos, the section provides useful information concerning the various technical analysis tools for every trade. We found out that a user needed to sign up with them before he gets a pass-way to the resources and tools. The endless quantity of educational materials also includes free webinars and informative e-books. The use of these extensive materials will put you in a better position than before to make great profits. Therefore, the next time you log into your account, spend sometimes to go through the materials. You will thank us later. As we said earlier, IQ Options provides a rich variety of strategies that helps clients make a kill in their trading ventures. It is the features that made us conclude that the platform provides clients with great knowledge when it comes to binary options. The resources are so many that every new user can easily get a strategy to use in a particular trading situation. Any professional trader will advise you to be attentive to the direction of trends and their strength. IQ Option avails Alligator, a versatile indicator of the trends in the market and periods when trends are not there. For you to place a trade, it is crucial to identify the exact entrance points. The task can prove to be daunting to any trader because it requires a lot of time to analyze markets and determine their conditions. However, IQ Option has availed the RSI, one of the most popular oscillators that operate perfectly on diverse market situations. Since every market condition has a different entrance point, you need a technical indicator that will find the exact entrance. Their RSI oscillator is the tool of choice since it will give the exact entrance as quickly as possible. IQ Option also gives clients full access to Bollinger Bands. Have you ever heard of such a term? If not, do not worry since the use of the indicator is as simple as 1-2-3. As a popular technical analysis indicator, Bollinger Bands defines the movement of a “normal” price range for a particular asset. Every investor can access these and many other strategies and indicators to make technical analysis. Once you land on the trading platform, they are there for you to use. You can effortlessly view the movement of trading trends on the technical analysis panel. You do not have to strain to make a trading decision based on completed analysis. IQ Option offers one of the most handsome payouts in the industry. if you trade well in a right condition, be sure to earn as much as 93% on your investments. A great binary options broker needs to avail rich opportunities for every trader to make mileages in profits. A great number of assets is one way through which brokers can avail these opportunities. A website that has just a couple of assets is not worth joining. Our review found out that IQ Option has vast assets in all the four common categories- Commodities, Forex, Indices and Stocks. The availability of assets depends on the working hours of the exchange. When we last visited the website, there were 32 out of 79 assets trading at that moment. They offer gold as a trading commodity. In our view, IQ Option needs to add more commodities from which traders can select when trading binary options. The stocks that were trading at that moment were 11 out of 22. They include AUD/CAD, AUD/CAD (OTC), EUR/GBP, EUR/GBP (OTC), EUR/JPY, EUR/JPY (OTC), EUR/RUB, EUR/RUB (OTC), and EUR/USD. Others include EURUSD (OTC), GBP/JPY, GBP/JPY (OTC), GBP/USD, GBP/USD (OTC), NZD/USD, and NZD/USD (OTC). On the other hand, indices include CAC 40, DAX, Dow Jones, FTSE 100, NASDAQ 100, Nikkei-225, and S&P 500. At the time of this review, the indices that were trading were three out of the available six. Seventeen out of the available fifty Equities were trading at the time of carrying out this review. 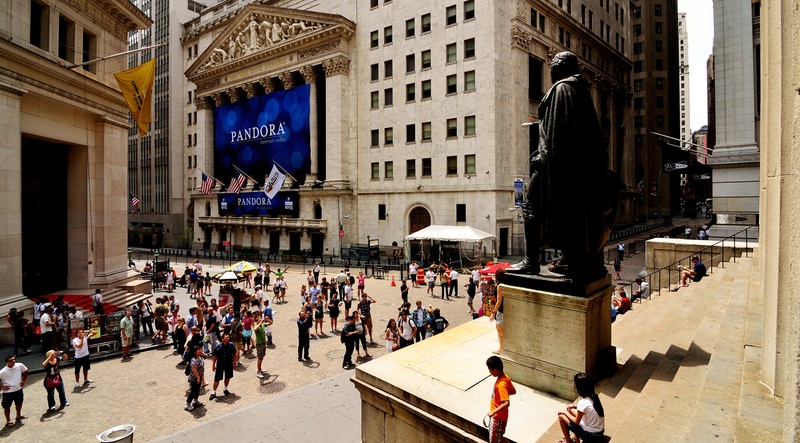 The Equities include IG, Allianz, Amazon, Apple Inc, Barclays, Boeing, British Petroleum, Chevron, China Mobile, Cisco, Citigroup, Coca-Cola, Commerzbank, Baidu, Banco Santander, Bank of America, Daimler, Deutsche Bank. Others in the list include Rosneft, Sberbank, SocieteGenerale, Toyota, UniCredit, Verizon, Vodafone, WALMART, and Yahoo! As we have seen, you can always get an asset to trade with on the platform. Awards have a way of showing genuineness and competency of the winner, particularly if the awards come from an independent body. Since most fraudulent brokers are out there to con traders their hard-earned money, always be on the lookout. A broker that has scooped some significant awards is worth considering. IQ Option is an awarding winning broker who has gained recognition as one of the thought leaders in the industry. Experts from MasterForex-V awarded the broker as the ‘Most Trusted Binary Options Broker.’ Thus, you can always trust the company when conducting transactions on their platform. If you thought those are the only awards that IQ Option got, you are wrong. 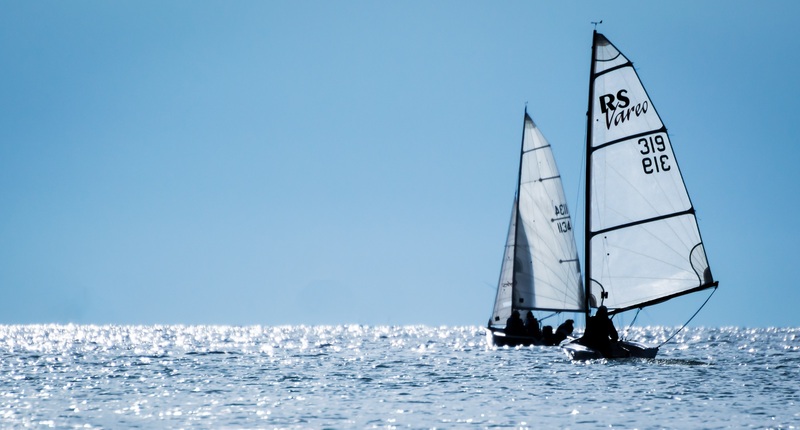 Race Award recognized the broker’ affiliate program as the ‘Best affiliate program in the industry.’ As such, the award confirmed that the broker would not disappoint anyone who wants to make extra cash through their affiliate programs. 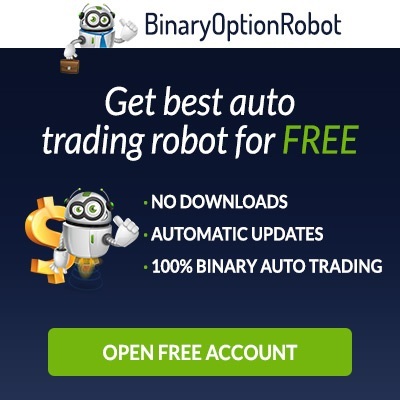 In conclusion, we highly recommend IQ Option for all your binary options trading needs. Their unique platform is the top-most feature in the industry that brings about the much-needed comfort and reliability. Their professional support team is there to handle every issue within no time, despite some drawbacks. Since the broker has scooped several significant awards, we believe every trader should trust it. Furthermore, their safe and secure banking processes, easy-to-use features, and education center brings a sense of professionalism and comfort to every trader, whether novice or veteran.